Summary: Tuareg-led rebels in northern Mali have taken the important city of Kidal, as well as two other towns, and are now advancing on Gao, the northern headquarters of the Malian military. 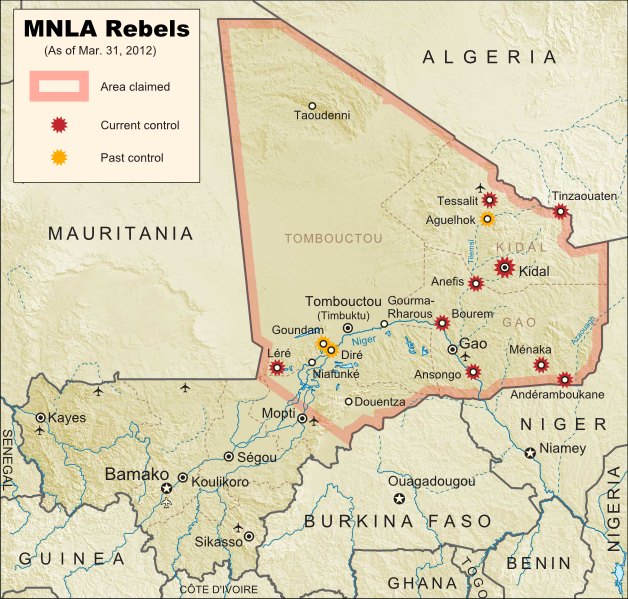 Towns captured by the Tuareg-majority MNLA rebel group in Mali. Modified from Wikimedia map by Orionist, incorporating images by Carport and NordNordWest (source). License: CC BY-SA. Right on the heels of our last Mali map update, the Tuareg-led rebels of the National Movement for the Liberation of Azawad (MNLA) have made a great deal of further progress, including their biggest victory yet. Yesterday the rebel group captured Kidal, one of the three main cities in northern Mali (the region in which they hope to establish an independent country called Azawad). This time, it was widely reported that the MNLA was working together with Ansar Edine (or "Ansar Dine"), an Islamist group also led by a veteran Tuareg fighter, but which the other rebels had formerly shunned. Just after overrunning Kidal, the MNLA was reported to have taken the towns of Bourem and Ansongo on either side of Gao, a key city containing the northern headquarters of the Malian military. Malian troops had previously announced their withdrawal from those two towns in order to focus their defense on the city. Now, the Tuareg fighters have entered the city of Gao, and are currently fighting to take the two military bases there. Follow events as they develop on Political Geography Now! To see only stories about this ongoing conflict, use the Mali filter.